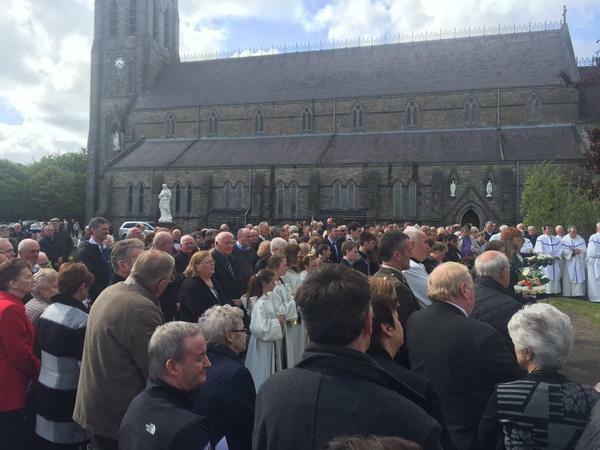 Family, friends, bishops and priests attending the funeral Mass of Bishop Thomas Flynn on Saturday heard his successor pay tribute to his commitment to catholic education and adult faith development. The Mass was attended by Bishop Flynn’s nieces and nephews and their families, as well as Cardinal Seán Brady, Commandant Kieran Carey, ADC to An Taoiseach Enda Kenny and other public representatives, bishops, priests and priest classmates his – Fr Michael Goaley, Fr Newell and Fr Laten. “Bishop Tom was a much loved man of this parish, and a Roscommon man”, Bishop Kelly acknowledged. Apart from the first six years of his priesthood in Tubbercurry, he spent his entire life in his native Ballaghaderreen parish. As president of Saint Nathy’s, Bishop Kelly said his predecessor was a reformer and moderniser, a process advanced in firm co-operation with Fr Andy Johnston, who succeeded him as president and who passed away on the very same day as Bishop Flynn (last Tuesday). 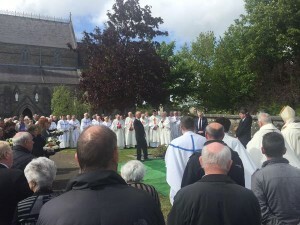 “At a time when school amalgamations were seen as the way to go, for wider curriculum and choice purposes, Bishop Tom and Fr Andy insisted that the voluntary and Catholic status of the united Saint Nathy’s here in Ballaghaderreen was the way forward,” said Bishop Kelly. He recalled that nationally, Bishop Flynn was at the helm for many years in educational matters as chairman of the Bishops’ Council for Education, including at the time of the negotiations around what became the Education Act of 1998. “Visiting the schools in the diocese and staying in touch with the young was a priority for him, something he instilled by example in the priests of the diocese too,” he said. Bishop Flynn was also a member for many years also of the Bishops’ Council for the Laity. He established the pastoral centre at Charlestown, and also the centre at Banada; he encouraged the development of the Father Peyton Centre at Attymass and was particularly involved in his latter years with the Sisters of Mercy in the development of the Hope House Centre for addiction treatment in Foxford. Bishop Kelly also noted that it was thanks to Bishop Flynn that the “finest history” of the diocese of Achonry was produced in Fr Liam Swords’ four volumes. Bishop Flynn was born on 8 July 1931 and baptised in the Cathedral of the Annunciation and Saint Nathy in Ballaghaderreen four days later on 12 July 1931. Ordained a priest of the diocese on 17 June 1956, he was ordained a bishop twenty-one years later on 20 February 1977, at the age of forty-six. Though he retired officially on 20 November 2007, he continued to administer the diocese until Bishop Brendan Kelly was ordained on 27 January 2008. He was “chief shepherd” of his diocese for thirty years and eleven months.